When building a new home you need to consider if the land your purchasing is in a flood zone. Most all new home structures including mobile and modular require an elevated dirt foundation. We can professionally build your house pad at any elevation you require and usually within a day or two. This link will show you the current FIRM as well as the new proposed FIRM anywhere in Louisiana. On the first page enter the address you wish to search and on the layers tab make sure you place a check mark in the box for the current as well as the proposed FIRM. Drag the slider on each to discover how the new flood map has changed compared to the old one. Discover the flood zone and Base Flood Elevation (BFE) depicted on the Flood Insurance Rate Map (FIRM) at any given point. If you click on different points on the map it will also give you the elevations of the land at that given area. To clear the points on the map click the points tab and click clear at the bottom. 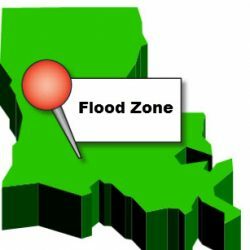 What Louisiana Flood Zones Are and How They Affect You. FIRMs display areas that fall within the 100-year flood boundary. Areas that fall within the boundary are called special flood hazard areas (SFHAs) and they are further divided into insurance risk zones. The term 100-year flood indicates that the area has a one-percent chance of flooding in any given year, not that a flood will occur every 100 years. Such maps are used in town planning, in the insurance industry, and by individuals who want to avoid moving into a home at risk of flooding or to know how to protect their property. FIRMs are used to set rates of insurance against risk of flood and whether buildings are insurable at all against flood. It is similar to a topographic map, but is designed to show floodplains. Towns and municipalities use FIRMs to plan zoning areas. Most places will not allow construction in a flood way. This entry was posted in abbeville, broussard, Clay, Compactable Dirt, dirt hauling, duson, Fill Dirt Delivered, Home Owners, la, Lafayette, maurice, milton, new iberia, rayne, scott, youngsville and tagged BFE base flood elevation, broussard, Clay, compactable dirt, dirt work, dump, duson, elevation, FEMA, fill dirt, Fill Dirt Delivered, FIRM, Flood Map, flood zone, floodplains, home buying, Home Owners, house pad, insurance, lafayette, Lafayette Louisiana., land purchase, scott, special flood hazard areas, trailer pad, youngsville, zoning. Bookmark the permalink.